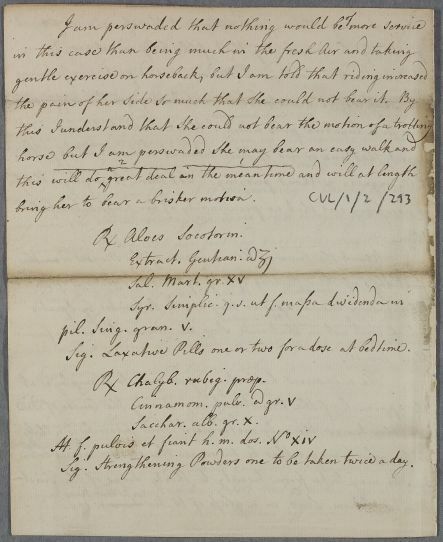 Reply, the form of a neat retained loose draft, for an unnamed 'Young Lady' with pains in the side which Cullen believes may be related to menstrual problems. 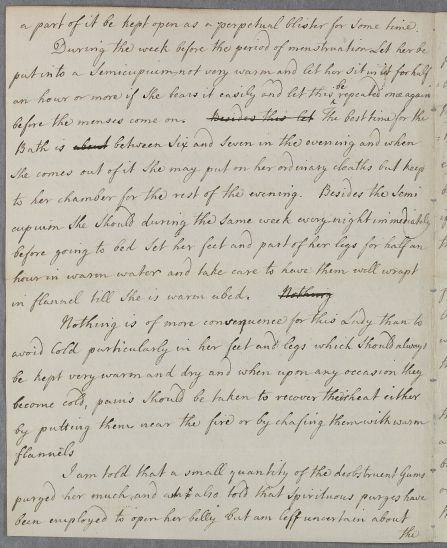 Summary Reply, the form of a neat retained loose draft, for an unnamed 'Young Lady' with pains in the side which Cullen believes may be related to menstrual problems. 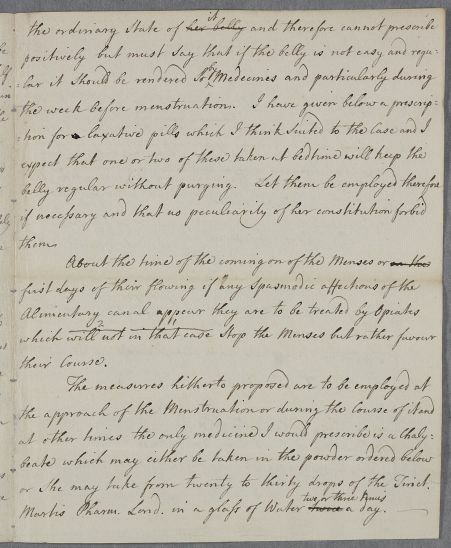 Case of an an unnamed 'Young Lady' with pain in the side and digestive problems. better but in the mean time. a part of it be kept open as a perpetual blister for some time. or she may take from twenty to thirty drops of the Tinct. Martis Pharm. Lond. 1 in a glass of Water twice (↑two or three times↑) a day. bring her to bear a brisker motion. Take a drachm each of Socotrine Aloes and Gentian Extract, 15 grains of Salts of Mars and enough Simple Syrup as to make a mass to be divided into pills of 5 grains each. Label: Laxative Pills one or two for a dose at bedtime. Take 5 grains each of prepared Red Chalybeate and ground Cinnamon, and 10 grains of White Sugar. Mix to make a powder, and in this way make 14 doses. Label: Strengthening Powders one to be taken twice a day. 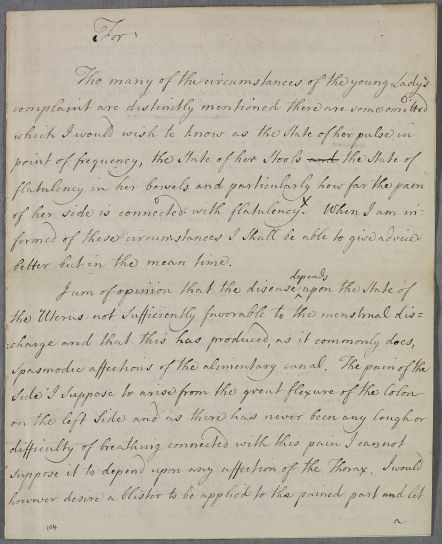 1: See The Dispensatory of the Royal College of Physicians, London (London: 1773), p. 272. Sig. Laxative Pills one or two for a dose at bedtime. Sig. Strengthening Powders one to be taken twice a day.